Viviscal Professional hair growth supplements are scientifically proven to help nourish thinning hair and promote healthy hair growth from within. Only Viviscal Professional supplements contain the exclusive marine protein complex AminoMar C™. Viviscal Professional is recommended and used by A-list celebrities, celebrity hair stylists, trichologists and dermatologists, across the world. 93% would recommend it to a friend or family member. Suitable for men and women. Viviscal Professional works in four stages over a six month period. Most users notice a difference after just three to four months. 100% Drug free. 111% Increase in terminal hairs after 3 months. 7.4% Increase in hair thickness after 6 months. Visible results in just 3 months. Dosage: 2 tablets per day with food. For more information click here. 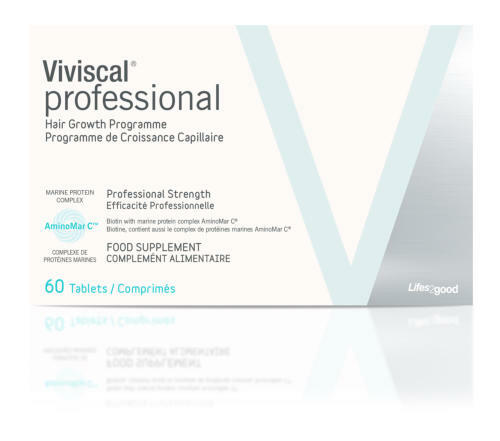 Viviscal® Professional Viviscal Professional hair growth supplements are scientifically proven to help nourish thinning hair and promote healthy hair growth from within. Only Viviscal Professional supplements contain the exclusive marine protein complex AminoMar C™. Viviscal Professional is recommended and used by A-list celebrities, celebrity hair stylists, trichologists and dermatologists, across the world. 93% would recommend it to a friend or family member. Suitable for men and women. Viviscal Professional works in four stages over a six month period. Most users notice a difference after just three to four months. 100% Drug free. 111% Increase in terminal hairs after 3 months. 7.4% Increase in hair thickness after 6 months. Visible results in just 3 months. Dosage: 2 tablets per day with food. For more information click here.